This page is about the British fighter Spitfire Mk Vb. For other uses, see Spitfire (Family). The Spitfire Mk Vb is a Rank III British fighter with a battle rating of 4.0 (AB) and 3.7 (RB/SB). This fighter was introduced in Update 1.77 "Advancing Storm". 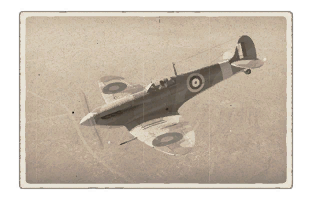 The Spitfire fills the turn-fighter class in the British line. It can perform many fighting tactics, such as energy fighting as well as turn-fighting. It has an impressive climb rate and turn time. 38 mm Bulletproof glass - Armored windscreen. 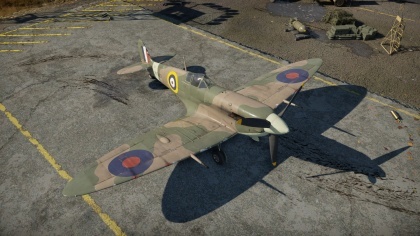 The Mk.V variants of the Spitfire series does not have the upgraded Merlin 47, but instead the Merlin 45 and thus may have poorer performance compared to the LF Mk.IX. However, the Mk.V carries more powerful ordnance compared to LF Mk.IX. Its wings can sustain a lot of stress, keeping still at steep dives and tight turns. Its control surfaces are large which means it has considerable control even at higher speeds. 20 mm air target belts are essential for dealing effective damage with your small ammo count. Radiator is extremely useful to allow you to run WEP for longer. Other manuverability upgrades are useful for turn fighting. This page was last edited on 3 April 2019, at 11:40.